#Bayefall Zikr (praise) Music blares from this #Fall appointed shop in the Coloban neighborhood of Dakar, Senegal, West Africa. 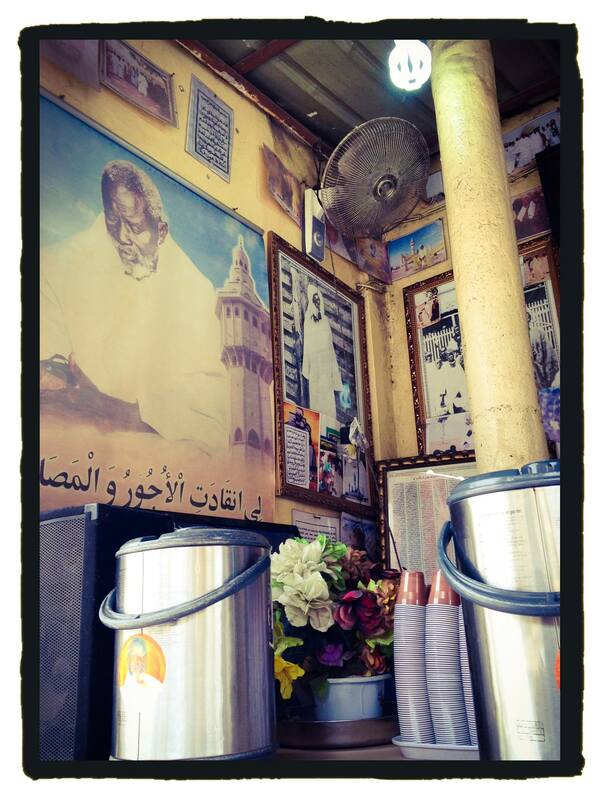 The specialty here is Cafe Touba; a coffee hand ground with a mix of spices, most importantly Diar. The coffee drink is sweetened with sugar. My favorite drink of Senegal! Cafe Touba’s namesake, Cheikh Ahmadou Bamba Mbacke, founded the holy city of Touba and is buried in the Grand Mosque there which stands in his honor. His followers, Baye Fall (after Bamba’s disciple, Cheikh Amadou FALL) a sect of Sufi Senegalese Islam, make and sell the coffee all over Senegal. You can come to this shop, or see men carrying large thermoses of it to sell along the streets, or sit at small tables set up on street corners everywhere. In seven years the price for one of these small cups has NOT changed. ‘Work’ is the way to God believes the Baye Fall. Making this coffee mix and farming Bambas ancestral farmland is part of the doctrine. Serigne Ahmadou Bamba peacefully resisted the French during their colonization of Senegal not unlike Ghandi did against the British in India. There were many miracles surrounding him. The French attempted many times to kill #Bamba but never succeeded. It is said the the Coffee has blessings and spirit. In Wolof the say Cafe Touba am FALL. Visit Senegal someday just for the coffee! To read more about Bamba and the Baye Fall start here http://www.wussu.com/hamedkane/ or google!